Look under the header "MORE" to see the link! Connect With Jennie Jackson "The Trainer Lady"
In 2010, Jennie was formally invited by the 2010 Alltech FEI World Equestrian Games to be the Official Breed Representative of the naturally gaited Tennessee Walking Horse where she introduced Dressage en Gaite to a well received international equestrian community. ​Jennie Jackson riding her naturally gaited Tennessee walking horse stallion Champagne Watchout at the World Equestrian Games at Lexington Kentucky Horse Park in 2010. Jennie Jackson has never been one who stands on the sidelines allowing life to pass her by. She is passionate about her beliefs and never hides this passion. Jennie is perhaps best known as the owner and trainer of the big naturally gaited champagne Tennessee Walking Horse stallion Champagne Watchout. Jennie introduced and published a brand new discipline for naturally gaited horses -- Dressage en Gaite-that is, dressage as applied to the gaited horse. Many thought dressage was not possible for gaited horses, but Jennie has been perfecting it for over two decades. 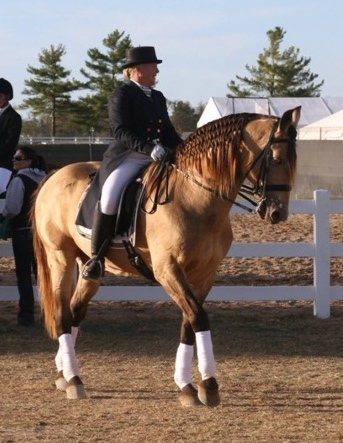 In 2010, Jennie was formally invited by the 2010 Alltech FEI World Equestrian Games to be the Official Breed Representative of the Tennessee Walking Horse where she introduced Dressage en Gaite to a well received international equestrian community. Jennie Jackson has thrilled crowds around the country with her one-of-a-kind naturally gaited dressage performances demonstrating the upper level movements of dressage on her naturally gaited Tennessee Walking Horse stallion. Jennie’s background is extensive, her enthusiasm is infectious, and her knowledge is transferable. She is a second generation horsewoman and carries on her family's ranch: Walkin-On-Ranch, originally from Corona, CA. Jennie’s equine journey began at the age of nine when she joined her local Pony Club in California. She advanced to reining and riding hunter/jumpers and was a catch rider by the age of thirteen. This was when she met her first Tennessee Waliking Horse. By her late teens, Jennie was riding in the Rose Bowl Parade and had the privilege of participating in the parade for eight years. Expanding her equine experience, Jennie led back country packing trips with mules and was asked to judge “Mule Days” in Bishop, California. After her children were born, Jennie taught them all from a young age to ride and show. They began by showing Ponies of the Americas that Jennie had bred and trained whilst Jennie was simultaneously showing Tennessee Walking Horses. One of Jennie’s lesser known areas of expertise is Haute école and circus tricks. By carefully observing a horse’s natural behaviour, Jennie teaches movements and tricks based on these behaviours that educate and entertain both human and horse alike. Jennie Jackson has proven to be an exceptional trainer, coach, and judge, both in and out of the show ring. She has traveled the country as a judge, clinician and exhibitor, and has held clinics in Israel for the Israeli Police Academy. Jennie riding naturally gaited Tennessee walking horse stallion Champagne Watchout at age 22, enjoying his golden years. Naturally gaited Tennessee walking horse Tango and Jennie enjoying their last beach ride before she hands the reins over to his new owner. Jennie with naturally gaited Tennessee walking horse Delight's Trump Card. TWH stallion Delight's Trump Card with owner Jennie Jackson. Thank you for visiting 4BeatDressage.com and Jennie Jackson Dressage en Gaite. Click the "Contact Jennie" button, call or send me an email.